Step back in time to the eighth century at one of Salzburg’s most important historic sites and one of Europe’s most beautiful churches. The cathedral’s seven bells have a reputation for being the best sounding in the country. It’s no wonder since the Salvatorglocke (Salvation Bell) is the second biggest in Austria, weighing 15.7 tons (14 tonnes). The Maria and Virgil bells are the only originals of the seven. A feature that music aficionados are sure to appreciate is the bronze Romanesque font near the entrance. The font was used during the baptism of Wolfgang Amadeus Mozart. The legendary composer was the cathedral organist from 1779 to 1781, and he performed his composition Coronation Mass for the first time here. During the annual Salzburg Festival, work by Mozart and other chamber music is performed in the charming cathedral square. This awe-inspiring place of worship is a prime example of 17th-century baroque architecture. It dates back to 774 when Bishop Virgil consecrated a cathedral on the site of the Roman settlement Juvavum. The cathedral has survived eight fires. The fire of 1598 ruined much of the original structure. Italian architect Santino Solari designed the present cathedral. Salzburg Cathedral is located in the Old Town, on the west side of the Salzach River. 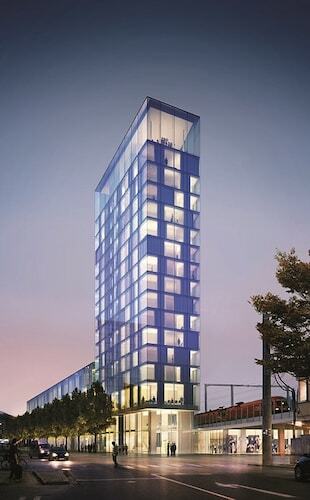 It’s within walking distance of other major attractions, including the Residenz palace. You can get to the Old Town by bus from Salzburg’s main train station. The cathedral is open daily, although only in the afternoon on Sundays and public holidays. Closing times are variable, so be sure to check the website before visiting. Entrance is free, although a donation is appreciated. This former monastery has been brewing beer since the early 1600s, using a recipe that’s been a well-kept secret for four centuries. Salzburg’s famous shopping street is known for its narrow, medieval houses as well as Mozart’s Birthplace and Museum. See one of the most beautiful wedding venues in the world at this magnificent palace, originally built as a grand gesture of love. Hop on a cable car and climb up to this mountaintop fortress, one of the biggest medieval castles in Europe. This charming cobblestone square features a statue of Salzburg’s most famous son, Wolfgang Amadeus Mozart, as well as the Salzburg Museum. This dramatic cliffside museum offers breathtaking views, both inside the galleries and outside the windows. Learn about the life, family and work of Wolfgang Amadeus Mozart via exhibitions in the rooms of the house where he was born. Discover the rich historical and cultural heritage of Salzburg at this award-winning museum, located in a palace complete with a chiming bell tower. Located in Elisabeth-Vorstadt, this hotel is within a 15-minute walk of Salzburg Congress Convention Center and Mirabell Palace and Gardens. Salzburg Cathedral and Fortress Hohensalzburg are also within 2 miles (3 km). Salzburg Central Station is only a 2-minute walk and Salzburg Gnigl Station is 24 minutes. Located in Elisabeth-Vorstadt, this spa hotel is within 1 mi (2 km) of Getreidegasse, Mozart's Birthplace and Kapuzinerberg Monastery. Salzburg Cathedral and Fortress Hohensalzburg are also within 2 mi (3 km). Salzburg Central Station is only a 3-minute walk and Salzburg Gnigl Station is 22 minutes. 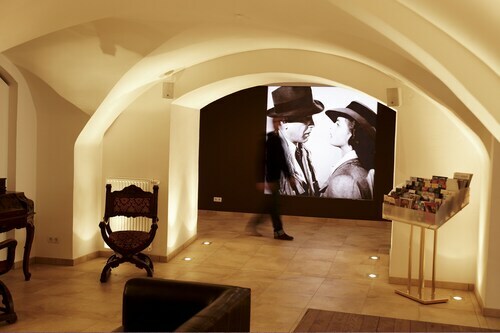 Located in City Centre Salzburg, this spa hotel is within a 10-minute walk of Linzer Gasse and Mirabell Palace and Gardens. Salzburg Cathedral and Fortress Hohensalzburg are also within 1 mile (2 km). Salzburg Central Station is 15 minutes by foot and Salzburg Gnigl Station is 21 minutes. 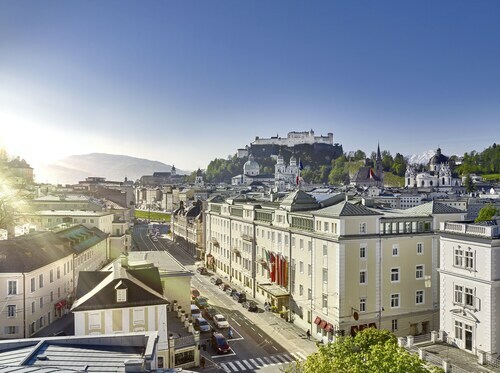 Located in Altstadt, this luxury hotel is within a 10-minute walk of Panorama Museum, Salzburg Cathedral, and Fortress Hohensalzburg. Mirabell Palace and Gardens and Hellbrunn Palace are also within 3 miles (5 km). Salzburg Central Station is 22 minutes by foot. 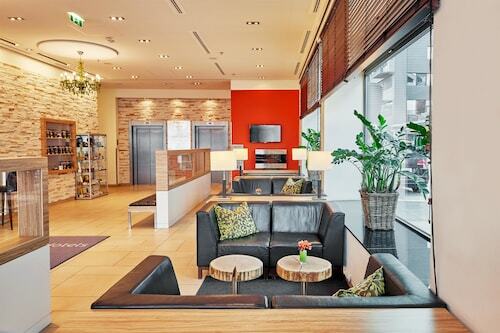 Located in the heart of Salzburg, this hotel is within walking distance of Salzburg Congress Convention Center, Mirabell Palace and Gardens and Mozarteum University of Salzburg. Also nearby are Getreidegasse and Mozart's Birthplace. Salzburg Central Station is 8 minutes by foot and Salzburg Gnigl Station is 25 minutes. Located in Altstadt, this spa hotel is within a 5-minute walk of Nonnberg Abbey, Fortress Hohensalzburg, and Salzburg Cathedral. Mirabell Palace and Gardens and Hellbrunn Palace are also within 3 miles (5 km). Salzburg Central Station is 28 minutes by foot. 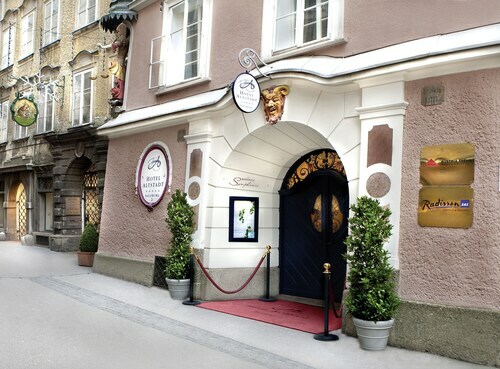 This family-friendly Salzburg hotel is located in the historical district, within a 10-minute walk of Salzburger Landestheater, Mirabell Palace and Gardens and Salzburg Cathedral. Fortress Hohensalzburg is 0.5 mi (0.8 km) away. Salzburg Central Station is 17 minutes by foot and Salzburg Gnigl Station is 28 minutes. 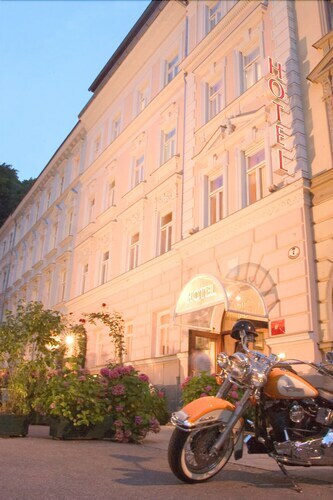 Located in City Centre Salzburg, this hotel is within a 10-minute walk of Linzer Gasse and Mirabell Palace and Gardens. Salzburg Cathedral and Fortress Hohensalzburg are also within 1 mile (2 km). Salzburg Central Station is 14 minutes by foot and Salzburg Gnigl Station is 19 minutes.